If you haven’t shopped flooring lately, then you’ll be blown away with all the different options available that put fashion at your feet. At Accent Flooring we offer a wide selection of carpet and flooring at affordable prices that will help you achieve a look that will have friends and family bragging about your sense of fashion. You’ll be wowed at the new designs and brilliant finishes that accompany both hardwood and laminate flooring as well as the new colors, patterns and styles of available in carpeting. Click on our PRODUCT links above and view hundreds of samples from our manufacturer’s websites. We’ve got great news for pet owners. 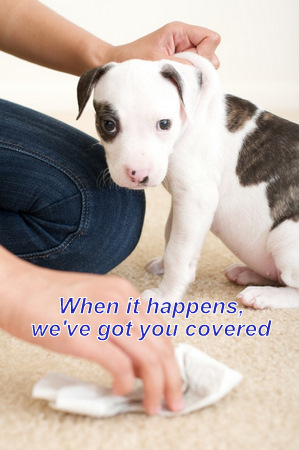 New innovations in carpet fibers, backings and even carpet cushion now make it easier for pet owners to handle those little accidents. Be sure to ask about our “Magic Fresh” carpet line. We’ve also got rugged yet beautiful laminate flooring designed to handle the larger four legged creatures that may have done a number on your existing floors. Come in and explore the many options that will make your life easier and your home more beautiful. We offer the brands you’ve come to know and trust because they offer style, quality, value, and the best warranties in the business.On display we have a great selection of carpet, beautiful hardwood floors, ceramic and porcelain tile, laminate flooring, bamboo and cork flooring, vinyl and more.